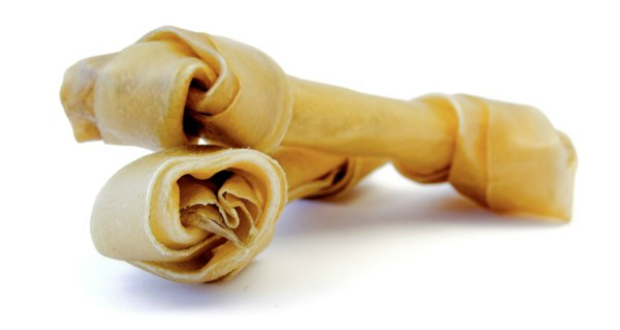 Sold at many pet stores, rawhides have long been a popular and tasty treat for big and small dogs alike. However, recent research and high profile cases of dog deaths resulting from rawhides have left many pet owners with questions regarding its dangers. Rawhides are made from cow or horse hides that are then smoked to give it the hard, chewy textures that dogs crave. However, like raw meat, rawhides that have not been properly prepared are at risk for containing salmonella. In addition, rawhides also contain allergens that some dogs just cannot handle. But more importantly, rawhides become choking or digestive blocking hazards to dogs when ingested too quickly or in chunks that are too big to be properly chewed. Being a responsible pet owner means knowing the dangers of common foods and treats. Before feeding your dog, always check first to ensure the safety and dangers that may result in a snack or a meal. From apple cores to onion scraps, being unaware of how your dog reacts to human food can lead to vet visits, long nights of becoming ill, or even fatal reactions.